The Beni-iro, is a bright red by the stain of safflower. Or in some cases to refer to the red of Purplish, that this case is of the three primary colors CMY colorant M of “magenta”. It is also read as “Kurenai” and “Koushoku”. In color name from the Heian era, in the sense of Ai was transmitted from Wu of China from “Kurenonai” to be called “Kurenai”. It is to be noted that the indigo of this case represents the “dye” not that of “Ai-iro”. In addition, it has been also referred to as “Karakurenai” in the sense that further transmitted from Tang. Safflower is an annual plant of the Asteraceae safflower genus. Dye that has been extracted from the ancient from safflower is used all over the world, in Japan was handed down in mid-retail price. Has been actively cultivated from the days of peace, those fermented and dried from picking the flowers of safflower is, red dyes and lipstick, such as cosmetics, has become a food coloring. By the way, safflower is I originally there are more of the yellow flower a yellow dye is, we take out the removed red dye yellow pigment by applying a number of processing. Safflower from sequentially pluck going beginning to bloom from the end of the stem, was called by the elegant name of “Suetsumuhana”. 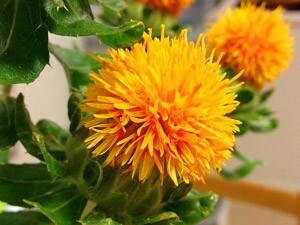 It comes from the “suetsumuhana” also safflower of the “Tale of Genji”. Glossy red was popular with the people of the Heian period, but safflower dye is very expensive deep dyeing was not able to wear only noble identity is a “Kinjiki”. In fact, the dye silk one small animal (= the two antiferromagnetic) in Beni-iro, will cost more than US thirteen stone, this will be about 1.3 million yen in modern terms. Although red-dyed was popular unchanged well into the Edo era, is policed ​​many times by such luxury ban, colors that do not use the red, such as “Jinzamomi” is produced still by the people who wanted the color of the red system It will be. Beni-iro Not only was loved by many people for a long time, such as the red circle of the Japanese flag is defined as “Beni-iro”, it is likely to say that familiar important color also for our country.